Great-grandson of Solomon Algazi the elder, and rabbi in Jerusalem in the eighteenth century. Besides contributing to dialectical, liturgical, and legal literature, he was the author of some valuable works on Talmudic methodology. 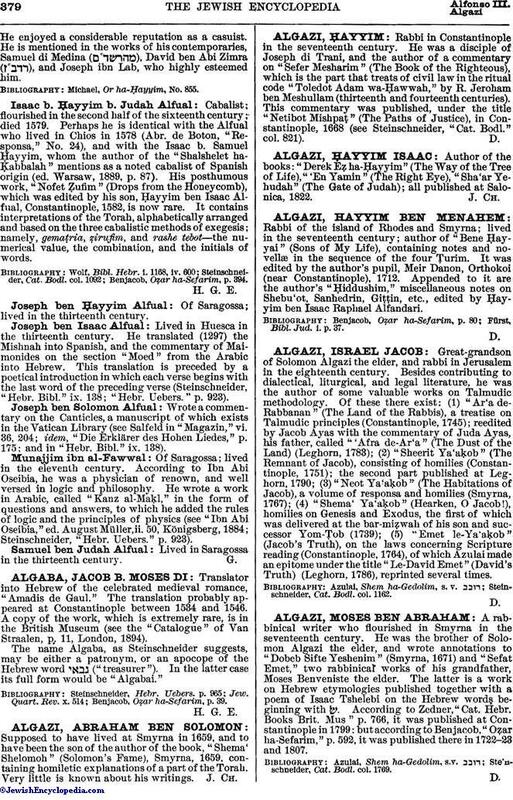 Of these there exist: (1) "Ar'a de-Rabbanan" (The Land of the Rabbis), a treatise on Talmudic principles (Constantinople, 1745); reedited by Jacob Ayas with the commentary of Juda Ayas, his father, called "'Afra de-Ar'a" (The Dust of the Land) (Leghorn, 1783); (2) "Sheerit Ya'aḲob" (The Remnant of Jacob), consisting of homilies (Constantinople, 1751); the second part published at Leghorn, 1790; (3) "Neot Ya'aḲob" (The Habitations of Jacob), a volume of responsa and homilies (Smyrna, 1767); (4) "Shema' Ya'aḲob" (Hearken, O Jacob! ), homilies on Genesis and Exodus, the first of which was delivered at the bar-miẓwah of his son and successor Yom-Ṭob (1739); (5) "Emet le-Ya'aḲob" (Jacob's Truth), on the laws concerning Scripture reading (Constantinople, 1764), of which Azulai made an epitome under the title "Le-David Emet" (David's Truth) (Leghorn, 1786), reprinted several times. Steinschneider, Cat. Bodl. col. 1162.